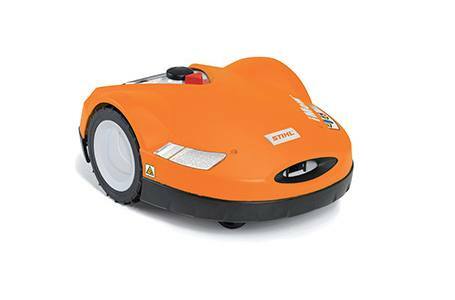 Finally, the automation you’ve been waiting for: the iMow™ Robotic Lawn Mower from STIHL. Enjoy more time relaxing and having fun while your lawn is being maintained for you. Once installed and programmed by your participating iMow STIHL Dealer, iMow cares for your lawn automatically and according to your desired mowing plan. Choose a STIHL robotic lawn mower to see the benefits for yourself. Removable Control Panel - The removable control panel of the RMI 632 P offers easy and comfortable programming, without having to bend down to reach the controls. The RMI 632 P can be programmed from the control panel when it is removed. More Intelligence – A Mower That Thinks - Your iMow works in accordance with a pre-programmed mowing plan, while still being able to react to changing conditions. Within a set timeframe called Active Time, your iMow decides whether or not to mow. For example, if it’s raining, the sensor tells iMow not to mow and to catch up on the lost mowing time later in the week. For rainy climates, iMow is capable of mowing in the rain and the rain sensor can be deactivated. Maximum Flexibility During Charging and Mowing - If your iMow robotic lawn mower has a large area to cover in a short time, it can recharge itself faster. If it’s taking the night off it charges itself slowly, thus extending battery life. When mowing, iMow adjusts its speed to suit the mowing conditions. On hilly terrain, the iMow robotic lawn mower uses its tilt sensor and adaptive slope speed to effectively mow slopes up to 24 degrees with the RMI 632 P model. Even Mowing Across All Areas - Utilizing different perimeter wire installation tools and its flexible programming, iMow can be programmed to mow a variety of different yard layouts (like a front or back yard). Your STIHL iMow Dealer can determine the best installation solution for your yard. Robust Blade - The mulching blade is a double-sized ground blade that changes its rotational direction after each blade stop to ensure it wears evenly. A Beautiful Lawn in Every Way - iMow has an edge mowing option to get a clean cut along the edges of your mowing area. You can also plan how your iMow returns to the docking station by choosing between following the perimeter wire or making the journey to the docking station in a more arbitrary way. Safety, Security and Theft Prevention - iMow is equipped with a variety of sensors. As soon as someone attempts to lift it or tip it, the mowing blade is designed to stop. A user’s defined PIN number can be set so that iMow’s menu can only be accessed after entering it. The PIN number cannot be changed – even if the battery is removed or the unit is reset – to reduce the possibility of theft. Quiet - iMow mows so quietly, your neighbors will hardly notice it’s there. Because iMow is so quiet, you can program it to mow at night. Powered by an advanced Lithium-Ion battery, iMow emits no emissions while working. Allergy Relief - iMow doesn’t kick up dust and dirt like a traditional mower which helps provide relief for people with allergies. Cutting Height : .75 - 2.25 in. Cutting Width : 11 in. Average Mowing Time (Per Battery Charge) : 150 min. Average Charging Time : 60 min. Weight (Including Battery) : 29 lbs. Dimensions (L x W x H) : 29 x 21 x 10.5 in.